The Obama administration just listed a total of thirty-six countries it describes as having “a tendency to promote, produce, or protect terrorist organizations or their members." Topping the list is the State of Israel. The list was compiled by the Department of Homeland Security, which says that visiting nationals from the countries listed be subjected to “special treatment” by US authorities. The department report, titled, "Supervision of Aliens Commensurate With Risk," included Israel among such states as Algeria, Bahrain, Egypt, Jordan, Lebanon, Saudi Arabia, Syria and Turkey. Visitors from these countries, all but five with Muslim majorities, are to undergo a special security screening called a "Third Agency Check" when detained by Immigration and Customs Enforcement. ICE officers are supposed to check all aliens they take into custody against the Terrorist Watchlist, which includes the identities of individuals the U.S. government knows or reasonably suspects to be terrorists. When ICE holds a citizen from a “specially designated country” in its own detention facilities, according to the agency’s standing policy, the individual is also supposed to be run through a TAC. “In addition to the Terrorist Watchlist screening, ICE uses a Third Agency Check (TAC) to screen aliens from specially designated countries (SDCs) that have shown a tendency to promote, produce, or protect terrorist organizations or their members,” says the inspector general’s report. “The purpose of the additional screening is to determine whether other agencies have an interest in the alien,” says the report. 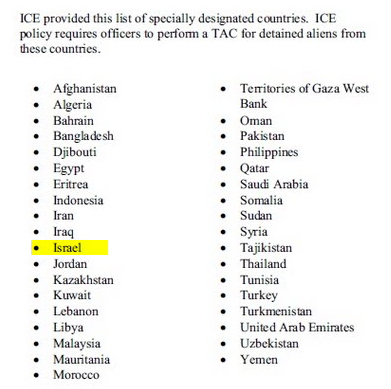 ICE declined to say who put Israel on the list or when Israel was put there. However, in her written statement, ICE spokeswoman Christensen said the “specially designated country” list had been created "at least" seven years ago - which would have been during the presidency of George W. Bush - and that ICE was not responsible for creating it. “This list of countries has been in existence for at least seven years,” said Christensen. But like so many other Obama administration efforts to blame its errors on the Bush administration, this is evidently also a lie. The investigative report cited a memo from Ted Stark, a supervisory special agent with ICE’s Office of Intelligence, that proposed creating a single federal list of “special interest” countries (plus the West Bank and Gaza) to aid federal agencies in screening aliens. “The proposed list, which officials said had yet to be adopted, includes 35 countries, most with significant Muslim or Arab populations. Almost 20 percent of the world's countries — including some of the United States' key allies, such as Jordan, Turkey and Egypt — are on the list. The 2008 list referenced by McLatchy that could have been left over from the Bush administration almost exactly matches the 2011 list that Obama’s people claim actually is a Bush administration list. Except that Israel wasn’t on the 2008 list allegedly created by the Bush administration. It was just another administration lie. One is tempted to suspect that the only reason that Obama adopted the list was to get Israel on record as being among the specially-designated terror-supporting states. Especially given the absence of Cuba or North Korea from the list. At the same time that the Obama administration slipped Israel onto the list of countries’ whose citizens are to be singled out by ICE for ‘special treatment’ the Clinton State Department announced it was planning an outreach mission to the Muslim Brotherhood in Egypt. The Washington Times is being charitable in its assumption that the White House is schizophrenic – that implies that it isn’t fully aware of what it is doing. At the very same moment in time that Obama includes Israel among the list of terrorist states, further de-legitimizing it, his State Department began taking steps to legitimize the Muslim Brotherhood! I wanted to do something wonderfully patriotic since this is the Fourth of July Weekend – I usually try to. But Obama doesn’t provide much in the way of material I can work with. Day by day, the country is slowly being transformed and nobody is quite sure what the final product is supposed to be. In Obamaland, you will be able to legally marry your hamster, but teaching your children the Bible is already practically illegal and in some places, can already cost you custody of your kids. In Obamaland, civil servants are your civil masters. Especially if they are Party Members. In Obamaland, it is teachers who decide what parents can teach their children. Obamaland’s version of religious freedom embraces Sharia Law while covering the Ten Commandments with a shroud. In Obamaland, your Constitutional rights are as sacred as the mythical deity that granted them. In Obamaland, the worst people are the rich, especially if they are white, Christian or Jew. In Obamaland, citizenship is secondary to Party membership. This year, the best way to celebrate the Fourth of July is to follow the advice of The Preacher. I'm taking Monday off to be with my family. We can worry about Obamaland on Tuesday. Enjoy the long weekend.